Iowa wineries are sure to surprise and delight you! 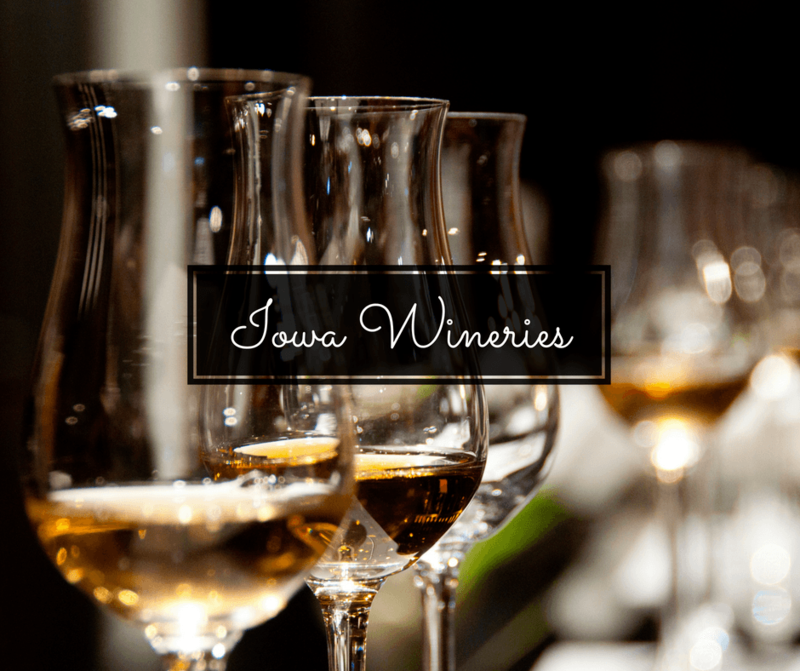 There are over 100 wineries in Iowa, with everything from exotic fruit wines to traditional grape wines. We had no idea there were so many wineries in Iowa! To be completely honest, Iowa as a whole surprised us very much. During our road trip across the Midwest, we fell in love with Iowa and all of the cool and quirky things to see and do. But what really blew us away were the Iowa wineries. So how many wineries are there in Iowa? Over 100! And there are over 300 vineyards in Iowa across 1,300 acres. That’s a lot of wine! We were in Iowa for a total of five days and as we headed east across the state along I-80, we stopped in various cities. We had a plan to visit museums, gardens, historic homes, etc. But it was when we were in Winterset, home to the famous covered Bridges of Madison County, that we learned about the wineries in Iowa. In Iowa, they grow different grapes than they do in California or in France; they plant what are known as cold-climate grapes that are able to survive in the cold Iowa winters. So the wine is a little different, but in a delicious and wonderful way! As we walked up to Madison County Winery, we already knew we were going to love it. There was a large patio with scenic views of the surrounding Iowa landscape and as we walked through the doors we saw comfy couches that looked very inviting. Then we were greeted by Genonne, and her friendly smile had us feeling right at home. We spent the next hour chatting with Genonne, tasting wines, and nibbling on a cheese platter. We learned more about the wineries in central Iowa and about Madison County Winery itself. The property had been purchased in 2000, and the grapes planted in 2001. It took a few years for the grapes to mature and in 2010 the tasting room was built so now guests could purchase and consume their wines on-site. We were really impressed with the selection of wines at Madison County Winery. It was hard to pick a favorite, but we will say that the Lollipop was probably the most unique. It tasted like a grape Jolly Rancher! When passing through the Amana Colonies (seven colonies that were founded by German immigrants back in 1855) definitely stop by Ackerman Winery. This is the oldest operating winery in the state of Iowa! Ackerman Winery has a large variety of wines, everything from fruit wines to more traditional grape wines. It’s no surprise that they consistently win international wine competitions! While we were there we had a few small samples (they offer daily complimentary tastings) and walked around their large retail area. If you’re passing through West Branch to visit the Herbert Hoover Presidential Library and Museum, going to Brick Arch Winery is a must. We think this is one of the best wineries in eastern Iowa! They had great wine, food, and the ladies that work there are fun and had us cracking up the whole time we were there. During our visit, we had a glass of Sweet Daisy, a fruity white wine that is similar to a Moscato. We could have easily drank a bottle of that wine! We also had some spinach artichoke dip that was very yummy. As we said earlier, they have great wine and food, but the atmosphere here is also what makes Brick Arch Winery so special. You can tell it’s a place that locals love to frequent, which is something we love. And it’d definitely be perfect for a girl’s weekend! Our last stop in Iowa was Le Claire, and in this charming town we visited Wide River Winery. It’s one of three locations they have. We didn’t spend as much time here as we would have liked because we had to get back on the road, but it definitely deserves a mention. We sampled a couple of wines, including one that paired very well with chocolate. Yum! Also in Le Claire, visitors will find Mississippi River Distilling Company. This family owned and operated company started small but has grown exponentially and is now one of the top craft distilleries in the country. All of the grains they use come from within 25 miles of their distillery; it doesn’t get much fresher than that! Their “grain to glass” approach is what makes their spirits so rich and flavorful. If you want to learn more about the company and how they produce their products, stop in between 12pm and 4pm; they offer free daily public tours on the hour (no need to make reservations). If you’d like to go straight to drinking, head to the bar for flights and delicious cocktails. All of the Iowa wineries that we visited had great tasting wines. Next time we visit the state, we want to travel along an Iowa Wine Trail (there are seven!). We’ll have to make sure someone else is driving though. That was the only bad thing about being on our own while we drove across the state. We’re just gonna say this… Iowa was lucky we were driving or we would’ve drank a lot more! Haha! For real guys, it seemed like everywhere we turned there was a winery! So much so that we came up with a nickname. And if this gets around and you hear it, know that we said it first! We think Iowa should be known as Wineowa! But seriously, we think the wineries in Iowa are great and really think they deserve more recognition. The wineries, distilleries, and even the Iowa breweries. We’re not into beer, but we can tell you there are Iowa beer trails as well. So definitely consider a visit to this amazing state. The wineries alone will leave you speechless! Wineowa is a cute name! Never thought Iowa would have wine and beer trails. We RVed through the state in 2011 and didn’t get a whiff of liquor! I didn’t know there were so many wineries in Iowa! I’d love to stop at the Brick Arch Winery, as I love the look of the building. I always do a fair bit of wine tasting wherever I go-wine is definitely an interest, both in travel as well as writing. But I did not know that Iowa was such a hub of wine production. Will have to visit when I travel to the U.S.
Wine and chocolate sound like a strange combination, but I know that they work really well together. I did a similar tasting in South Africa and really enjoyed it. There certainly seems to be more than enough wineries to choose from in the region to keep you busy for quite a while. It is just the kind of place that I would love to spend a few days exploring. Had no idea Iowa was a wine producing state! Great to know it has so many wineries and they are open to visit. Love the idea of a tour, visiting lots of the wineries to do a tasting. I would definitely like to add in the distillery as well. I had no idea that there were so many wineries in Iowa! You were so lucky to visit so many. The wine that seemed closer to my preferences is Sweet Daisy, since I am Moscato lover! The problem is that you do not know when to stop drinking this sweet wine! Wine + Iowa = definitely not a combination I would ever think to put together! I imagine the cold weather grapes suit some of the german wines – so Ackerman would be where I’d head! Also like the idea of all those distilleries! 100 wineries in Iowa! That is quite a lot. I am sure the wine trail there makes for a wonderfully heady experience. What I love about wine tours is that apart from the wines one gets to experience the intoxicating beauty of the surrounding natural landscapes. I am really enamoured here by looking at the picture of the Madison County Winery. The patio looks like such an enchanting place to chill taking in the spectacular views. I don’t think of wine when I think of Iowa. That is cool to know. That is a lot of wineries. The places there look really nostalgic too.